LAFM TV 13th Season! Episode 6! October 17, 2018	Comments Off on LAFM TV 13th Season! Episode 6! Hello everyone! We have a great show lined up this week so make sure to check us out in your area by clicking the link! Check out our Week 7 Recruiting Recap featuring Ascension Catholic High School, Donaldsonville High School, Kentwood High School, Ouachita Parish High School, Plaquemine High School, Port Allen High School, and Sam Houston High School! LAFM TV Show! 13th Season! Episode 4 Now Available on YouTube! October 11, 2018	Comments Off on LAFM TV Show! 13th Season! Episode 4 Now Available on YouTube! Missed our last show? Well, not to worry as we got you covered with the latest episode now available on our YouTube page. Click the link to find out more information! Check out today's prep team spotlight on the Ouachita Parish Lions, which is a team that is looking like a contender in 5A with an impressive 5-1 record in their first six games! LAFM TV 13th Season! Episode 5! October 10, 2018	Comments Off on LAFM TV 13th Season! Episode 5! You don't want to miss this week's show! We have former NFLSU superstar Brian Kitchen, Marlon Harrison, and you also get to hear the voice of the Byrd Yellow Jackets Charlie Cavell. Make sure to click the link for more information! It is really hard to believe that already the season is in district play as it seems like the season just started yesterday. Not only has the regular season picked up for a lot of these high school teams, but the recruiting has heated up as well. Trying to keep track of it all, our staff was able to cover a couple of teams this week and visit with the coaches as well as the players to give us a recruiting update! Check out today's prep team spotlight on the Logansport Tigers who are looking for their second Class 1A state championship in three years after another great start at 5-0 in the first half of the regular season! LAFM TV 13th Season! Episode 4! October 3, 2018	Comments Off on LAFM TV 13th Season! Episode 4! LAFM TV Show! 13th Season! Episode 3 Now Available on Youtube! October 3, 2018	Comments Off on LAFM TV Show! 13th Season! Episode 3 Now Available on Youtube! 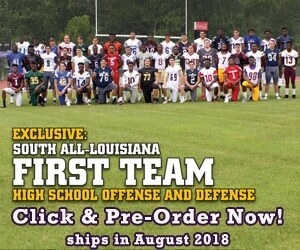 We already have passed the midpoint of the Louisiana High School Football prep season, but Louisiana Football Magazine’s staff got you covered. Each member of the staff covered a couple of teams and caught up with some of the coaches and players to see what is going on with the following programs below in terms of recruiting after Week 5 of prep play!